The Kroger Co. corporate headquarters in downtown Cincinnati. Kroger Co. on Thursday said that Mark S. Sutton has been elected to its board of directors. 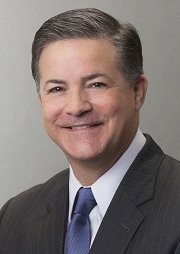 Sutton is chairman and CEO of International Paper, a leading global producer of renewable fiber-based packaging, pulp and paper products. Prior to becoming CEO, he served as president and COO with responsibility for running the company's global business. "We are delighted to welcome Mark to Kroger," Rodney McMullen, Kroger's chairman and CEO, said in a statement. "Mark's deep experience in an end-to-end business and global perspective make him a valued addition to Kroger's board of directors." Sutton is a member of The Business Council and the Business Roundtable. He serves on the boards of the American Forest & Paper Association and the International Advisory Board of the Moscow School of Management – Skolkovo. He also serves on the boards of Memphis Tomorrow and the New Memphis Institute. Sutton is elected to serve until Kroger's annual meeting of shareholders in June. At that time, he will stand for election by the shareholders.